Arkhaven has not been standing pat despite a few unexpected curve balls slowing it down. The answer to last week’s oft-heard question, “when will Alt-Hero #3 be available on the Arkhaven Direct store?” turns out to be “today”. We had a bizarre problem where entering the ISBN number to load the book into our inventory produced a book called Adam Bede by V.A. 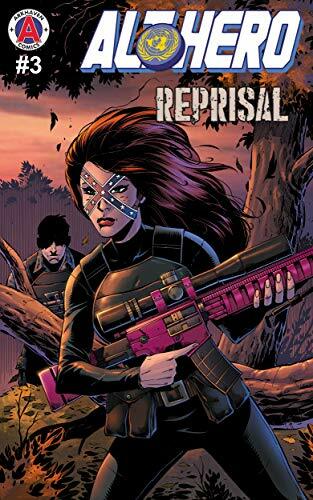 Sutton instead of the expected Arkhaven comic, but the problem has been resolved and the gold logo edition of Alt-Hero #3: Reprisal is now available for $2.99 from the Arkhaven Direct store. In other Arkhaven news, we are very close to finishing Alt-Hero #4: The War in Paris. We will probably release it the first week of September. We have also decided to produce premium editions of all the Alt-Hero comics for the comic book stores, which will retail for $4.99, feature alternate covers, be printed on heavier 70-pound paper, and have a larger, more conventional 10×7 store-friendly form factor. The premium editions will be available from Arkhaven Direct as well. The first alternate cover has been commissioned, will feature Dynamique in Paris, and is being drawn by one of our new Alt-Hero artists. Castalia reader opinion poll: if you could have one Castalia-published title or series turned into a graphic novel series, which would it be? Moth & Cobweb is not in the running, since we’re already doing Swan Knight Saga, and we’re not ready to contemplate tackling Arts of Dark and Light yet. Nothing is definite, we’m just interested in getting people’s opinions now that we’ve got a number of very good artists interested in working with us.